You are among a fortunate few who have the privilege of living on a lake as lovely as Watchic. It is a quiet, small lake, with a country atmosphere. 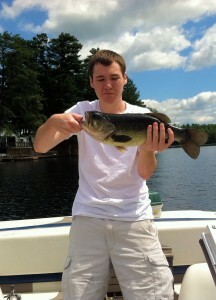 Watchic Lake is located in the town of Standish in Cumberland County, Maine and is part of the Watchic Lake Watershed. 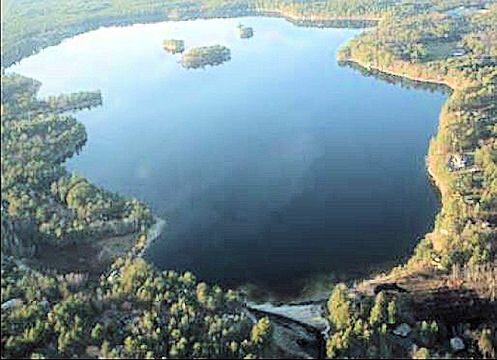 The surface area of the lake is 448 acres (3/4 mile wide, 1½ miles long), and at is deepest point is 41 feet deep. 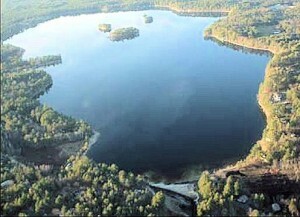 The lake is spring fed and has two inlets, Page Brook and Paine Brook. The outlet is Watchic Brook and it empties into the Saco River at the dam end of the lake. There is a public beach – Kiwanis Beach on Route 25. 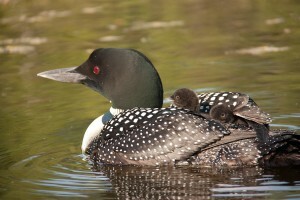 We are privileged to have one or two loon families on the lake each year. They usually arrive the day after ice out and generally nest on one of the islands or in the swamp. Each year they parade their chicks for us to enjoy. PLEASE respect their space when boating. There are many other birds to enjoy around Watchic. You will see Baltimore Orioles, Kingfishers, Cormorants, Chickadees, Titmouse, Grosbeaks, Finch, Woodpeckers, Doves, and many more. Eagles and Osprey have been spotted more frequently. 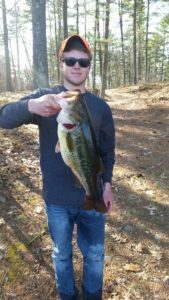 There are a myriad of warm-water fish species in the lake, including small and largemouth bass, pickerel, perch, and sunfish. 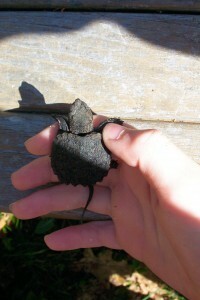 And of course, a collection of painted and snapping turtles, crayfish, and the occasional snake. A dam at the north end of the lake controls the water level of the lake. The dam, owned by the Watchic Lake Dam LLC, is opened to lower the water level on about October 15th, and is closed again to raise the water level shortly after ice-out. This helps to avoid shore damage from ice. Depending on rainfall during the season the dam is opened and closed in an attempt to maintain the water level in the lake. We are fortunate that Watchic Lake has not experienced invasive plants such as variable leaf milfoil (myriophyllum heterophyllum) or Eurasian watermilfoil (myriophyllum spicatum). Please be aggressive in looking for these invasive plants when launching boats, kayaks, canoes, etc. More information on these plants can be found at the Lakes Environmental Association website. Non-motorized craft are welcome to launch from the Kiwanis Beach. Many residents enjoy boating, water-skiing, kayaking, canoeing, etc. via access through their own or neighboring properties. Please respect the 200-foot offshore distance at any speed other than headway. This helps keep erosion at a minimum and protects our lake. Remember, when skiing and tubing, you must have a spotter on-board in addition to the driver, according to Maine law.